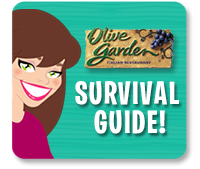 A bunch of fresh new items were recently planted on the Olive Garden menu! Some are great picks... others not so much. We've got your most up-to-date guide for navigating a meal at O.G. -- read up and get hungry! This is the best option on the new Tastes of Italy small-plates menu. Skip the fatty aioli it's served with, but enjoy the balsamic drizzle and sprinkling of Parm. WARNING: Don't mistakenly order your Parmesan Asparagus "Crispy," a.k.a. deep fried. That version has 420 calories and 29g fat. HUGE DIFFERENCE! You might not even realize it's available, but you can order the classic house salad with low-fat dressing! You'll save 60 calories and 6.5g fat per serving (which can add up if you go the unlimited-soup-salad-and-breadsticks route). If you wanna skip dressing altogether, a serving of the salad has just 60 calories and 2g fat. If you love a light broth-based soup, it's all about the Minestrone. If you watch your sodium intake, the Pasta e Fagioli is your best bet of the three. And if a creamy broth with sausage and potatoes sounds good to you, the Zuppa Toscana is just what you need! Another HG warning: Make SURE you specify the Red Wine Sauce, not the Creamy Alfredo -- that version has 23g fat! Why goop up your nice grilled chicken like that? If you've gotta have it, stick with ONE. But skip those dipping sauces -- the buttery breadsticks are good enough on their own! A nice, simple meal done right. A double dose of seafood in white wine sauce, paired with some garlicky broccoli. Perfect! This may be the healthiest option on the whole menu. The omega-packed fish is finished with Italian herbs and just a bit of extra-virgin olive oil. A side of seasoned broccoli completes the meal. Smart stuff! Three words: caramelized garlic cloves. Mmmm! To slim down the stats even more, request extra veggies in place of the cheesy mashed taters. Nothing about this recent addition feels like deprivation -- you get a steak with sautéed Italian veggies and roasted garlic. Yum. Yum. Yum. And now a moment of silence... The Venetian Apricot Chicken is no more. If you miss it, grab a copy of HUNGRY GIRL TO THE MAX! or HG 1-2-3 and make the Glaze-of-Sunshine Apricot Chicken! While one might think a serving of pasta with a tomato-based sauce might not be so bad, the sauces at O.G. are FREAKISHLY fattening. 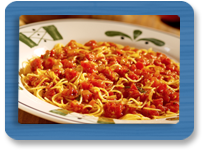 Yes, even the Fresh Tomato Pomodoro and especially the Primavera -- the latter has 390 calories and 26g fat!!! And that's JUST for the sauce. If you must have pasta at the Garden, go for the Tri-Colored Vegetable Penne (350 calories, 3g fat) with a side of the Marinara Dipping Sauce from the appetizer menu (80 calories, 3.5g fat). 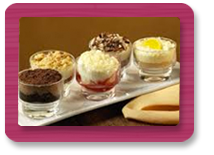 It's all about the Dolcini mini desserts! There are five options, each with 210 - 290 calories (PointsPlus® value of about 6 - 8*). The Strawberry & White Chocolate Cake is the lightest of the bunch. The full-sized desserts are bad news, unless you're splitting them with a crowd. HG FYIs: No doubt about it, the sodium counts are pretty high on most chain-restaurant meals. If excess sodium is a concern, you may want to avoid dining out at chain restaurants, or do a lot of special ordering (avoiding sauces, seasonings, etc.). Also, Olive Garden doesn't provide sugar or fiber counts, which is why those aren't listed here. PointsPlus® values were calculated with 0g fiber; the exact values may be slightly lower. Pass around this treasure trove of information right now! Click "Send to a Friend" ASAP. March 21st, a.k.a. TODAY, is Twitter's birthday! If you don't already, follow HG on Twitter for updates and behind-the-scenes posts from Lisa herself.